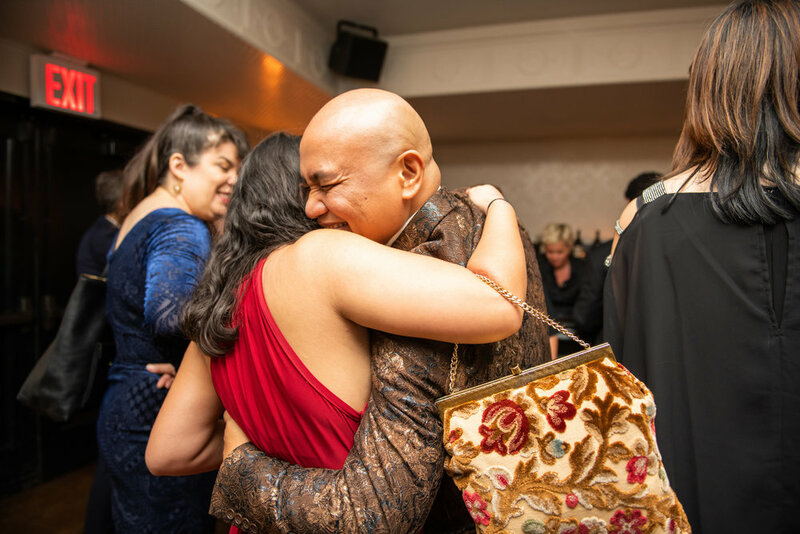 On October 6th, 2018, Kundiman celebrated our 15th Anniversary with a "Letters to the Future" Benefit Gala at the Ace Hotel NYC! What a memorable night it was. With the support of all of our attendees, we raised $15,567 in a single night! That brought us to $41,879 of our original $46,000 goal, which was a stunning success, and will be such a large boon to the future of Kundiman. Photos from the night are on Facebook, and here's a little more about the wonderful evening we had. The room was filled with futuristic and food-adjacent flower arrangements, as well as photos from the last fifteen years of Kundiman. We wanted our beloved array of fellows to be present in the room, even if they physically couldn’t be in New York! Honorees Monique Truong & Myung Mi Kim take in our photo wall. Our host, Jes Tom, led the way as we heard from several speakers who embody Kundiman’s core values of generosity, courage, and inclusion. R.A. Villanueva was at our very first Retreat in 2004, and he also was a Home Group Leader at our first Youth Leadership Intensive. Emily Lu and Krista Caasi, two brilliant students from our inaugural Youth Leadership Intensive, read testimonials about the program to the audience. Our esteemed honorees, Ligaya Mishan, Monique Truong, and Myung Mi Kim, all spoke so eloquently about our past, present, and future. We were so grateful to be able to honor each of them on this luminous occasion! Kundiman fellow Jen Lue read tarot cards all evening, giving us an even more intimate look into our future. The silent auction was filled with goodies like original artwork from Naruki Kukita and Aldrin Valdez, a gift box from Aesop, golden flatware from Hudson Wilder, and a monthlong membership to Equinox. Guests were encouraged to write letters to their future and hang up their hopes in lights on one of the walls. Thank you to everyone who has had part in Kundiman for fifteen years of embracing the untried, of radical love, and for the promise of a future that will certainly be filled with joy. We couldn’t have done it without our Benefit Committee and all of our volunteers. We also send our most enduring gratitude to The Ace Hotel New York for hosting us, The Breslin for feeding us, and to our sponsors for helping this entire night come together so well: Alice James Books, Janklow & Nesbit, Lagunitas, Timothy Marriner Lynch, and Zai Lai. Hugs to all of our guests! Newer PostSharon Wang's "Republic of Mercy" is Out from Tupelo Press! Older Post15 Kundiman Fellows Featured At LitHub!